The ForexGoldInvestor MT4 EA is a forex expert advisor. The Forex Gold Investor automated forex trading software for the MetaTrader platform places trades for you. The ForexGoldInvestor.com forex robot trade on precious metals, specifically on GOLD. 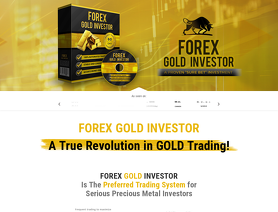 Forex GOLD Investor is the preferred trading system for serious precious metal investors. It is the most advanced precious metals trading system we've ever created. We are traders that have spent thousands of hours researching, developing and testing the best trading algorithms for the precious metals market. We use Forex GOLD Investor. We depend on our algorithms to grow and protect our investments. This isn't just a product for us. It's our life's work and we've left nothing to chance. Forex GOLD Investor went through a 3-step development process designed to minimize risk and create the most profitable EA available. - We tested all proven "buy on deep", "buy and hold", "scalp the trend" and other impulse and trend following strategies. - Refined and enhanced the best models highly efficient proprietary algorithms. Forex GOLD Investor is fully automatic: It isn't swayed by emotion. Our adaptive algorithms perfectly executes each trade. Forex GOLD Investor is one of most rigorously tested EAs available. Our team has stress-tested the EA with historical tests and thousands of real-life trades. Forex GOLD Investor is sophisticated enough for veterans and simple enough for new Gold traders. No need to learn a inch-thick manual to start trading - just follow a few basic rules.